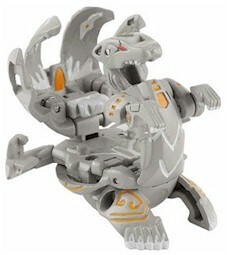 Lumagrowl is a wolf/fox-like Bakugan with six tails, who when in Bakugan form, almost resembles Hynoid. He is partnered with Kazarina. He with Kazarina make up the Haos team for the Gundalians. Lumagrowl is partners with Kazarina of the Twelve Orders. Hardly ever shows emotion making it difficult to tell what it's thinking. The swords, which equip Lumagrowl's tail, attack all round from close to intermediate range making it a lethal foe. Spreading out the tails in a special way unleashes a strong lightning bolt immobilizing opponents. Creates a cage around the body with the tail, which illuminates and blocks the opponent's attack. Purchase your Lumagrowl from Amazon now!